Taste testing at Southern Accent! 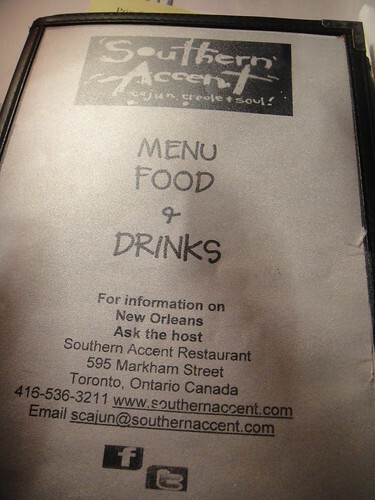 Southern Accent has resided at 595 Markham Street on Bloor Street for over 29 years (next year will be their 30th anniversary!). 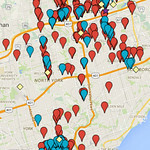 It is super close to Bathurst Subway station, making it an incredibly convenient restaurant to visit. Mandy and I literally walked 2 minutes by crossing the street from the subway station doors to down the street where the restaurant was. 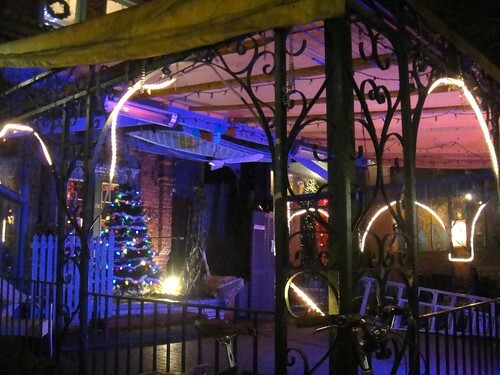 The front of the restaurant was decorated in lots of Christmas lights and there was a giant Christmas tree in the patio where guests would enjoy their food in the summertime. Joyous music was playing delightfully as we pushed open the door and into the Creole setting. Our mouth-watering night was foreshadowed to us when three ladies who were just leaving the restaurant left the words “loved this place!” in the air. 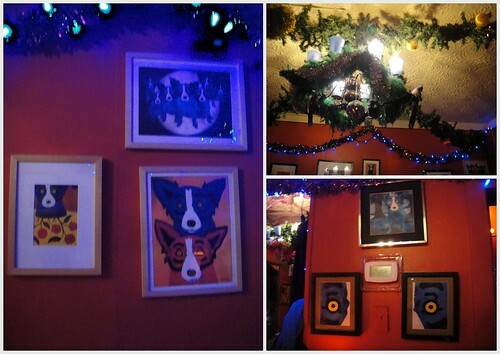 We were seated in a private dining room called the “Blue dog room”. Lots of paintings by a famous artist created art with blue dogs, hence the name. Our friendly server, Wendy, greeted us and introduced us to the restaurant’s rich history and its cuisine. Wendy has been working at Southern Accent for 20 years and her experience at the restaurant was apparent as she had a thorough understanding of the items on the menu as well as showing a genuine passion for the dishes. I became even more excited by listening to her describe the drink list to us that sometimes her words sort of flew over my head (I’ll talk a little more about this later). Wendy recommended all the notable cocktails on the menu, including the Hurricane, Cajun Caeser, and Gaitor Bait to us. At last, I chose the Cajun Caeser which has a bit of a spicy kick to it and Mandy chose the Gaitor Bait which is more fruity. Lots of menus covered our table. Lots to choose from! 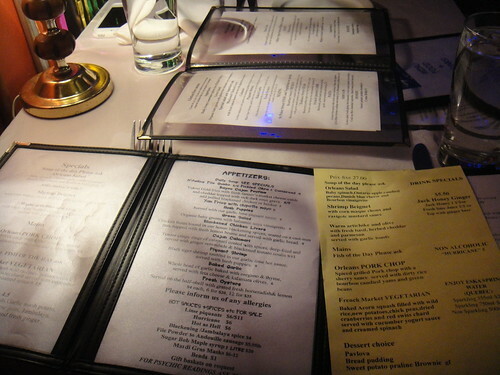 Wendy was kind enough to leave the menus with us so that I could go through the items on the list if I chose to. 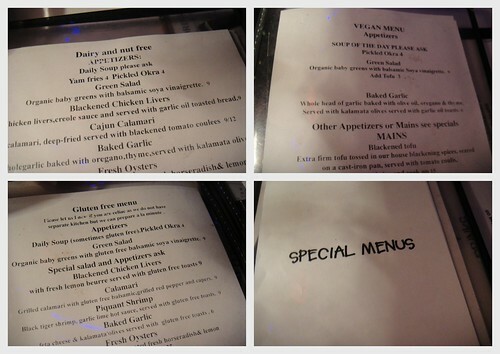 She also brought out the ‘Special Menus’ so that we were aware that they cater to gluten-free, vegan, and nut- and dairy-free dishes as well. This was very admirable as each of these 3 lists were very extensive. Anyone who has special dietary restrictions will surely have no problem choosing a dish for all three courses at Southern Accent. When our cocktails arrived, I excitedly snapped the first photos and took a sip. 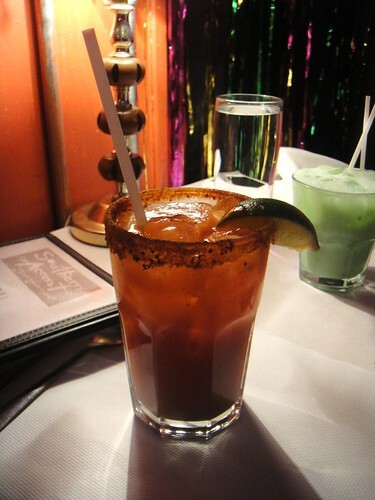 My Cajun Caeser indeed had a spicy kick to it. It tasted a little bit like Tabasco sauce at first that was a bit watered down, but a couple of sips later and I started liking it more and more. I had a sip of Mandy’s Gaitor Bait and found it to be exactly how Wendy had described it: fruity and smooth. You couldn’t really taste the alcohol part of it until the end. I really liked it! If it was mine, I probably would have finished the whole thing in a couple of seconds; it was just that good and easy to drink. 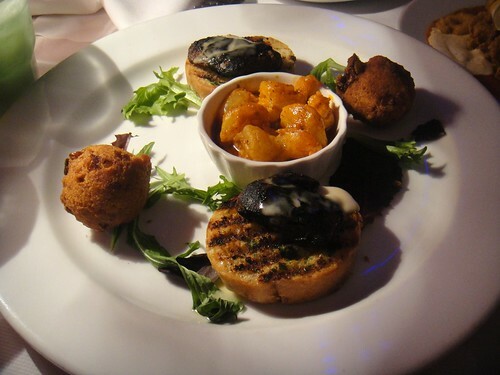 Before long, our tasting portions of the appetizers arrived. We had a mighty good selection of what they have to offer! I was very impressed. Upon placing down the dishes, Wendy very thoroughly explained each of the appetizers to us. Again, I was still so giddy that a lot of what Wendy said went over my head. I joked to Mandy that I should have brought a recorder so that I could have captured everything that Wendy said so that I could complete this blog more accurately. But I digress. I loved the selection and couldn’t wait to dig in! 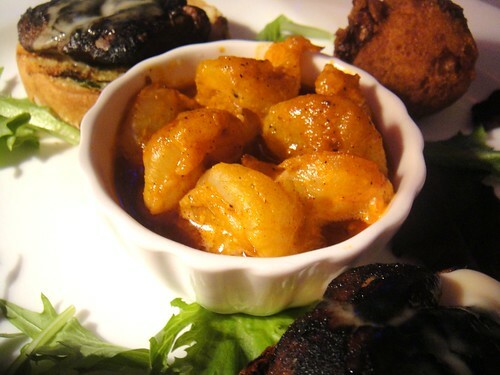 There were two plates of appetizers: One plate was filled with three varieties of delicious Cajun starters. 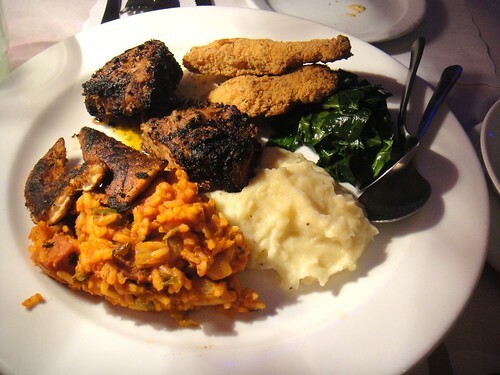 It included the restaurant’s infamous “Blackened Chicken Livers”. Wendy told us that if they ever got rid of this item on their menu, there would be a town full of people demanding to get it back. It was a gorgeous piece of chicken liver blackened with their house spices and seared on a cast-iron pan. It was placed on top of a perfectly toasted garlic bread. I’ve had duck liver before — duck liver pâté — but never chicken liver with garlic bread. It smelled so good. One bite and I found it amazingly flavourful and soft. It was perfectly paired with the garlic bread that was also perfectly toasted; crunchy on the sides and soft in the centre. 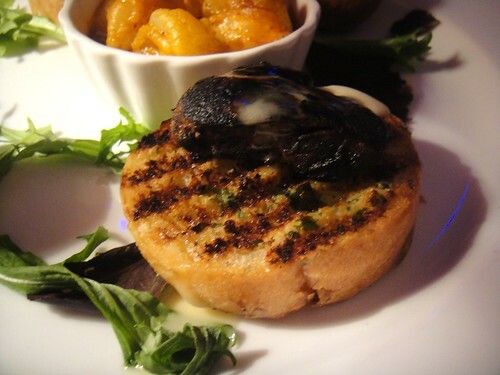 No wonder this appetizer is such a high-prized item of the restaurant! I loved the Piquant Shrimp that was served in the middle of the plate. There were four black tiger shrimps that were sautéed in garlic lime hot sauce. The shrimps were perfectly cooked and the specialty hot sauce was to die for. I loved it! It is such a lovable sauce that they actually sell it in bottles at the restaurant so that guests can take it home and further enjoy it. The hot sauce was just hot enough to leave a zing but not so strong that it burned your tongue. This was my favorite appetizer since I love well-flavoured shrimps! On the side of the appetizer plate, we also got to try their Hush Puppies. 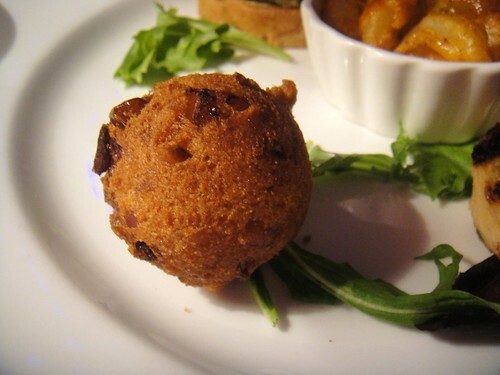 Hush puppies are not the brand of shoes that some of you might be familiar with, but here, they’re fried cornbread made into a sphere that you can dip into the garlic lime hot sauce. It was a ball of cornbread goodness. I’m still on the journey to find the perfect cornbread after having first tried a piece in Philadelphia last year and also recently when I was at Big Bone BBQ and Wicked Wings but found both to be quite lackluster. The Hush Puppies contained soft cornbread inside. It was fairly good. I liked dipping it into the hot sauce and it made for a really good starter. Lastly, the second plate of appetizers contained what Wendy called “the best calamari of the city” and that we had to try it to agree. I was a little skeptical of it since I absolutely adore calamari and just had a plate recently at Forget About It Supper Club. It’s one of my favourite starters to order. 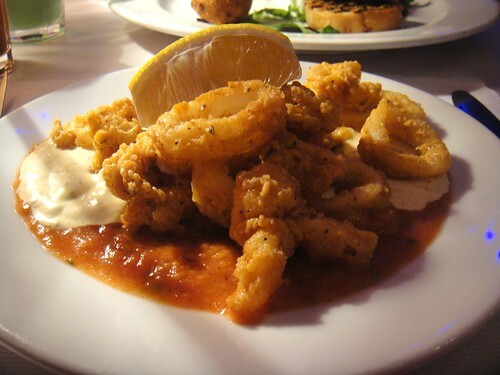 Their Cajun Calamari has tender rings of calamari cooked with spices, deep-fried, and then served with ginger remoulade and blackened tomato sauce. I liked the bite-sized pieces and they were fried to a crispy goodness. I liked the blackened tomato sauce and found the ginger remoulade to be the best condiment to dip the calamari into. It first, I didn’t quite agree with Wendy’s bold claim of it being the best in the city, but after a few more bites, I really enjoyed it. 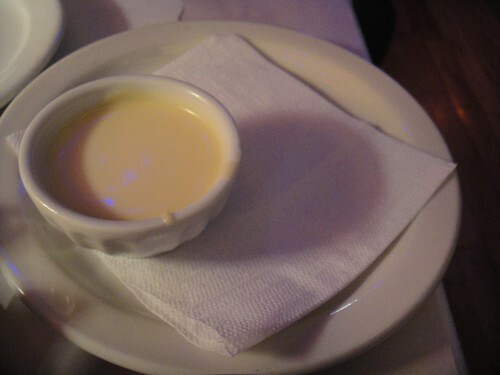 First off, the Mash potatoes were incredibly creamy! I wish I had more of it since I love mashed potatoes and this was pretty well done. The collard greens! Oh, SO good! Although the rest of the items on the plate was very unique and wonderful, I adored the familiarity of these vegetables. They remind me of smaller-cut leaves of the vegetables that I usually have at home. It was very refreshing after the meat portions. The Dauphine Street Cracker Catfish was crispy and I loved the pickled jalapeno tartar sauce that accompanied it. The meat inside the fillet was firm and well done. 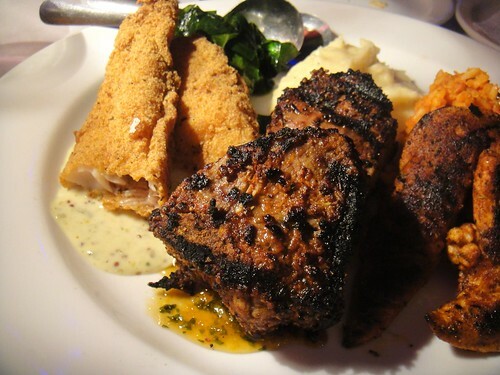 I remember the time when I had blackened catfish at N’Awlins Jazz Bar and Restaurant, it was over-seared and too hard. 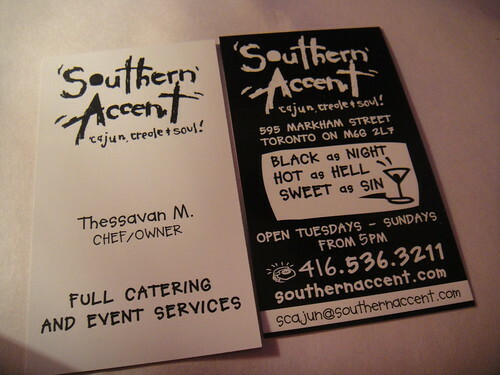 Southern Accent sure knows how to do it right! The Bourbon Street Chicken was boneless and tasted really good with the lemon beurre. The Canal Street Creole Jambalaya was very, very delicious. I’ve had jambalaya before and I quite enjoyed it here. 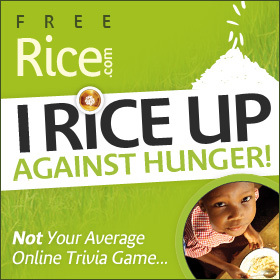 The seasoned rice was soft and the chicken pieces were soft and tender. You can’t go wrong if you had ordered an entire portion of this since it was so appetizing. And lastly, the French Quarter Lamb! We each got to taste a piece of blackened, grilled lamb loin chops that were marinated in rosemary, white wine, mustard with apricot, ginger and mint glaze. Like I had mentioned before, I was so giddy and overwhelmed with all the food choices that even though I heard everything that Wendy had said, her words went in one ear and came out the other and I actually thought that I was cutting into a piece of chicken when it was actually the lamb loin chops! Mandy and I had a field day with this one and couldn’t stop laughing at my apparent confusion. No wonder when I sliced into the firm meat of the lamb and placed a morsel into my mouth that it tasted so firm, and flavourful, and… different! Silly me. It was lamb! The lamb was very well cooked. It was medium rare as it was a little pink inside but the meat itself was tender and not coarse at all. Very delicious. 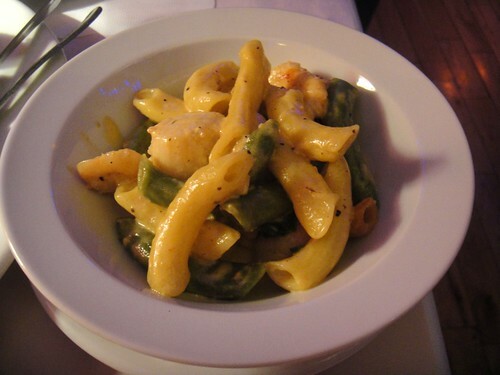 The final main dish that we tasted was the Voodoo Seafood Pasta. It was a small bowl of colourful penne pasta that had shrimp and scallops in it. The penne was surprisingly good and was al dente. I loved the creamy sauce that was smothered throughout the dish. The sauce was also very slightly spicy but it was, again, nicely paired with the penne. And that’s it! Those were ALL the mains we tried. A truly excellent selection of what the restaurant has to offer. Once Wendy cleared our plates, I was wondering in the back of my mind whether there would be any dessert to try out as well… but as it was a complimentary tasting menu, I didn’t want to ask in case they didn’t offer any. In any case, before it got to that point, Wendy kindly invited us to take a tour through their cozy restaurant. We walked through the romantically lit room that had intimate seating and lamps that looked very much like a fortune teller’s orb. To our surprise, they actually have an in-house psychic that offers fortune telling every night for $40 for 15 minutes. The psychic was with a client as we walked through the room too. How very cool! Their 1940s bar was delightfully lit and looked very inviting. Upstairs, they have two private rooms for dining. One was called the “Boo” room. I’ll let you look at the picture I took to figure out why it was named this. 😛 The other room was also perfect for parties and private dining. 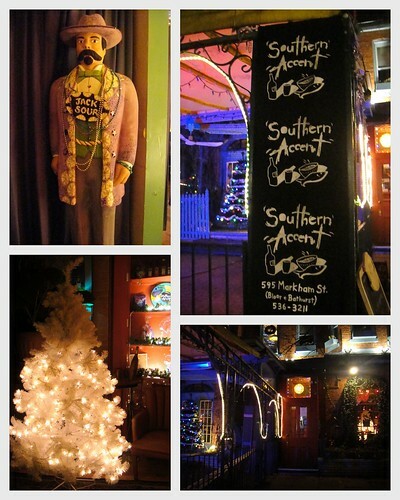 It was currently decorated with lots of Christmas lights and Mardi Gras beads. 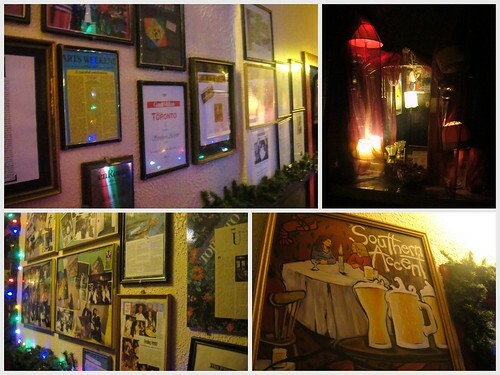 The hallway to the restrooms (that were also decorated in a festive fashion) was full of framed newspaper and magazine articles that depicted the long history of the restaurant and its acclaims for their food and restaurant. Twenty-nine years of service is quite a celebration indeed! 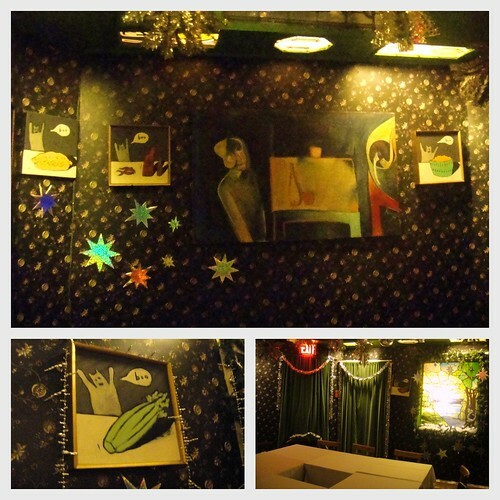 Can you see why this was called the “Boo” room? 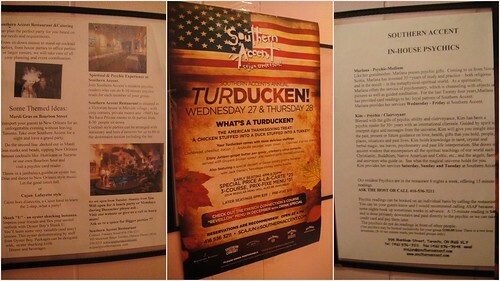 They host a Turducken feast every year! We ended the tour and when we got back downstairs to our table, I spied with my little eye… something that was sitting on the top of our table!! I might have exclaimed a little too loudly to Mandy as we walked closer, but my eyes didn’t deceive me. We had a dessert sitting on their table waiting for us to eat it! Yay! I was very happy to know that we had dessert to try out as well! (For those of you reading this, I’m NOT crazy; I just love complete meals and desserts a little too much 😉 ) I very patiently waited for Wendy to come by our table again so that I could ask her what dessert it was before we dove into it. 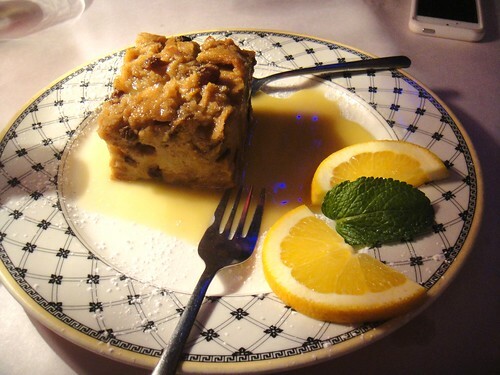 She was glad to tell us that it was a Nawlins Bread Pudding with apples, pecans, and raisins embedded inside of it and served with bourbon sauce. I’ll end the longest food blog I’ve ever written by saying if you want to enjoy some delightful and exquisite Cajun and Creole dishes, Southern Accent is the place to go. 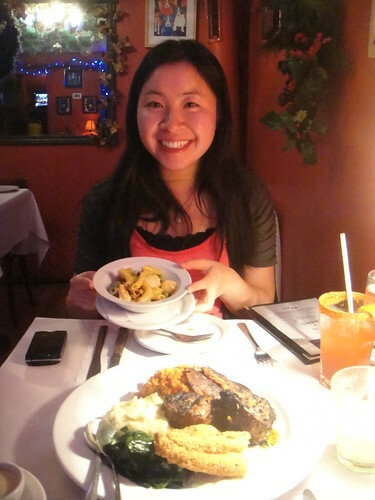 It’s a convenient stop by Koreatown in Toronto, full of friendly servers (make sure you ask for Wendy as she’ll try her best to give you the lowdown on the food), and with wonderful Southern hospitality. When I return to this restaurant in the future, I would love to try out more of their appetizers, jambalaya, catfish, lamb, and their baked cheese grits. I would say from what I tasted today that nothing on their menu should disappoint. 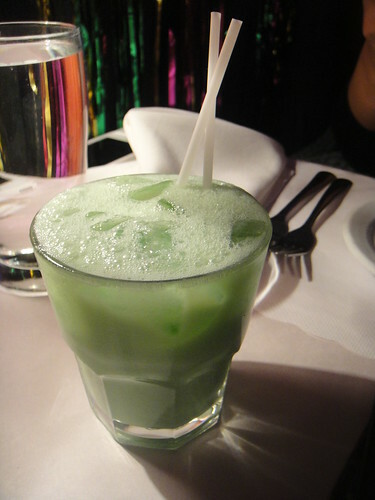 Their drinks and desserts are a must-try too. FTC Disclaimer: Although Southern Accent reached out and invited me to a complimentary tasting menu to review their restaurant, the opinions expressed here represent my own and not those of the restaurant. This entry was posted in Complimentary Adventures, Food, New Experiences and tagged @CajunToronto, Blackened Chicken, Blackened Chicken Livers, Cajun-Creole cuisine, Catfish, food blog, foodie, Hush Puppies, Koreatown, Piquant Shrimp, restaurant review, Soul, Southern, Southern Accent, Tasting menu, Toronto, Voodoo Pasta. Bookmark the permalink.